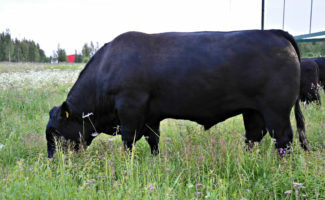 Best known beef breed in the world..
Saareõue OÜ, initiated in 2009, is a family business making it’s way in the fields of livestock, breeding of the Aberdeen Angus cattle and growing organic grains. The company reigns over 500ha of arable, of which 130ha is purely for pasture purposes. The first animals suitable for breeding were brought from Yxskaftkälen farm, Sweden, in 2012. Since then the cattle has been complemented yearly with new and exciting lines of breed. Our main goal is to once again reveal the original characteristics of the animal – mild calving, good growth, fantastic nurturing skills and calm temperament. Our cattle is mainly a mix of Scottish, Australian and New-Zealand lines of breed. Utac Outlier av Yxskaftkälen is for SALE! e-mail: info@saareoue.ee Utac is ET bull, who is brouht from Yxskaftkälen farm in 2015. He is very calm and has a perfect temperament. Utac has a nice long body and a bit higher legs, than our other breeding bull's. He started working in our farm in 2016 spring. TYSON RADAR - SOLD! Tyson Radar av Yxskaftkälen worked in our farm in 2015-2018 and now he will start working in two angus farms in Germany. New owner Dietz said that Tyson is moderate size bull with good muscling. He will suit to their farm and environment very well. Tyson will start working allready in december 2018. We wish good luck and all the best to the new owners! Tyson Radar is brought from Swedish breeding cattle Yxskaftkälen in 2014. Tyson has a very impressive family tree, starting with father Netherton mr Radar from Netherton farm, Scotland. 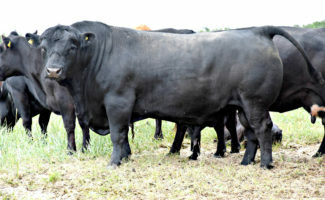 By now this bull is sold with undisclosed price to Genus Breeding LTD. The grandfather Dunlouise Evesund from mother side of the family tree is also Scottish, originating from Dunlouise cattle. Dunlouise Evesund is 100% original Scottish Angus. Saareõue Partner OÜ on 2014. aastal asutatud pereettevõte, mille peamiseks tegevusalaks on mineraalsöötade, farmitarvikute ning loomaveohaagiste müük.